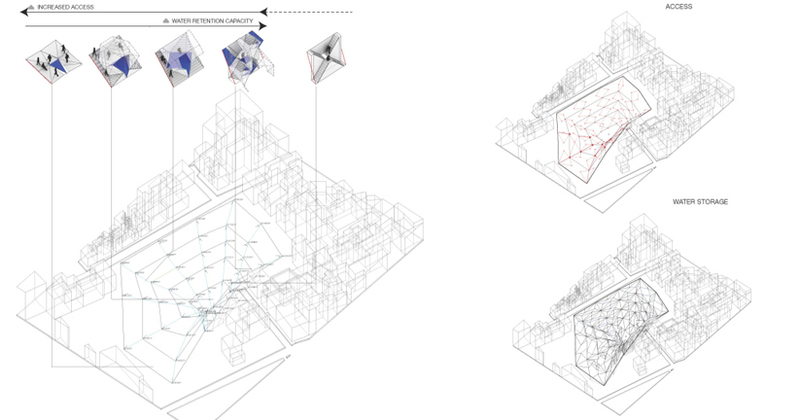 The thesis of this project is that local knowledge of a specific ecology, embedded in a culture, can be reformulated to help that culture adapt to modern urban issues and create strong patterns for sustainable development in a society. 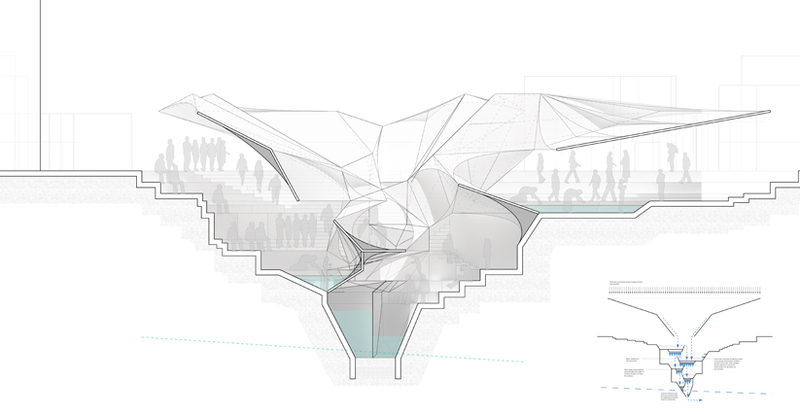 This project seeks to reinvent the typology of the step well as a civic and community space for the contemporary city of Kathmandu in order to address issues of water shortage and contamination in the city. Traditional Ecological Knowledge (TEK), refers to the knowledge that an indigenous people group has embedded in their culture, language and practices. This knowledge is built up over generations of living in a particular environment and as such the practices of a people reflect close relations with their ecology. The development of these traditions are evident in the products of the culture, and the spaces that a culture builds and inhabits. Nepal is one of the most water rich countries in the world, but because of rapid urbanisation, changing governments and modernisation of the city infrastructure, the water ecology of the valley has become negatively affected, rivers have been polluted and groundwater has dried up from overuse. 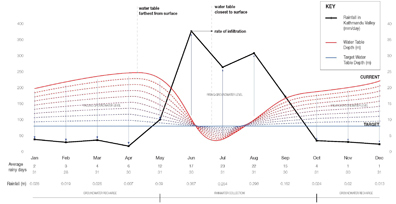 A dramatic difference between wet and dry seasons in the valley further exacerbates this problem as inadequate storage solutions for water in the winter means inadequate supply in the summer. 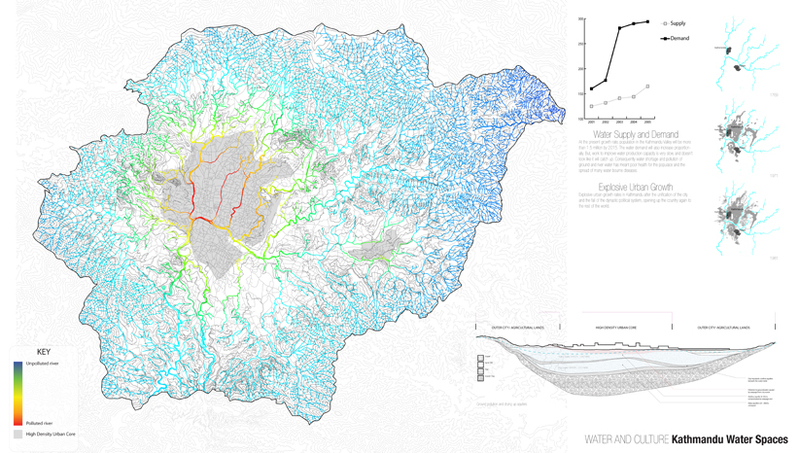 The water spaces of Kathmandu used to function, and still do to a certain extent, as the arteries of water supply in the city. Unfortunately, due to rapid urbanisation and the adoption of Western ideas about how a city should function, these traditional step well spaces are rapidly being forgotten and destroyed by the expanding city. The community structures that once maintained them have disintegrated due to changing ideas of community and public space. The ecology of the Kathmandu Valley is based on very wet monsoons and underwater aquifers that retain a percentage of the rain through the dry season. 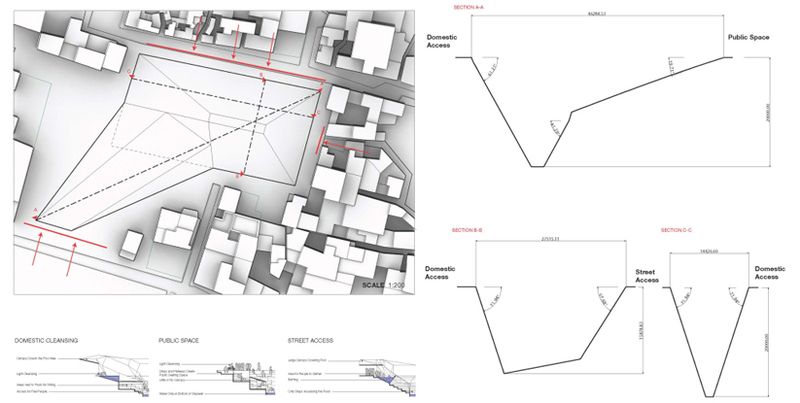 By exploring the potential of rainwater harvesting to augment and recharge the groundwater aquifers of Kathmandu, this project focuses on the reformulation of the traditional forms of water management and social space in order to augment the existing water ecology of the valley and create urban spaces for the re-development of community trusts. 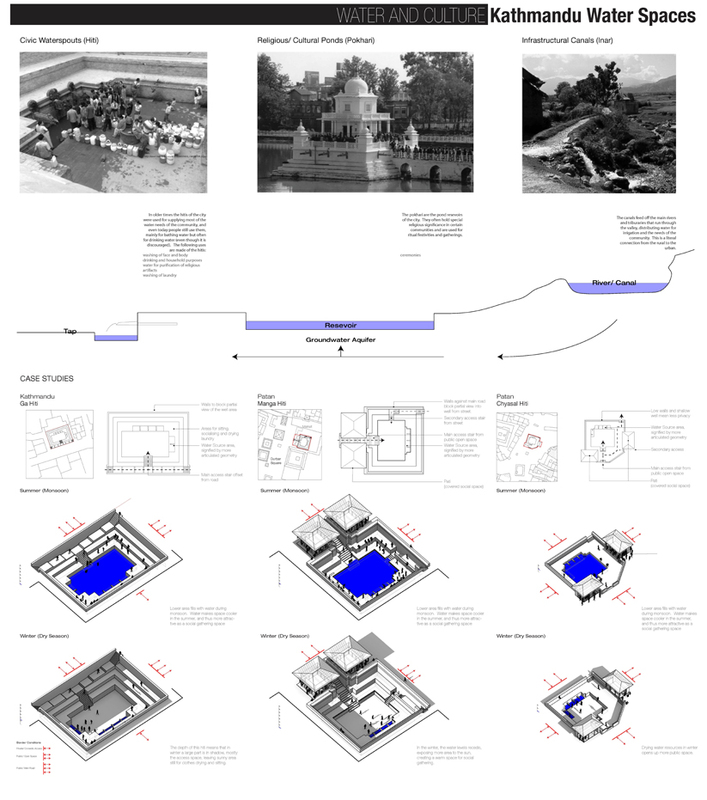 A stepwell augmented by a canopy that connects with the stepped structure to create pools will filter water slowly through the course of the year, evening out the sharp difference between groundwater levels in dry and wet seasons and acting as a flywheel for the local recharge of underwater aquifers. Traditional knowledge is often lost or diminished with the adoption of modern, and in the case of most developing countries, Western systems of knowledge, which more often than not are inappropriate for the culture and ecology in which they are deployed. 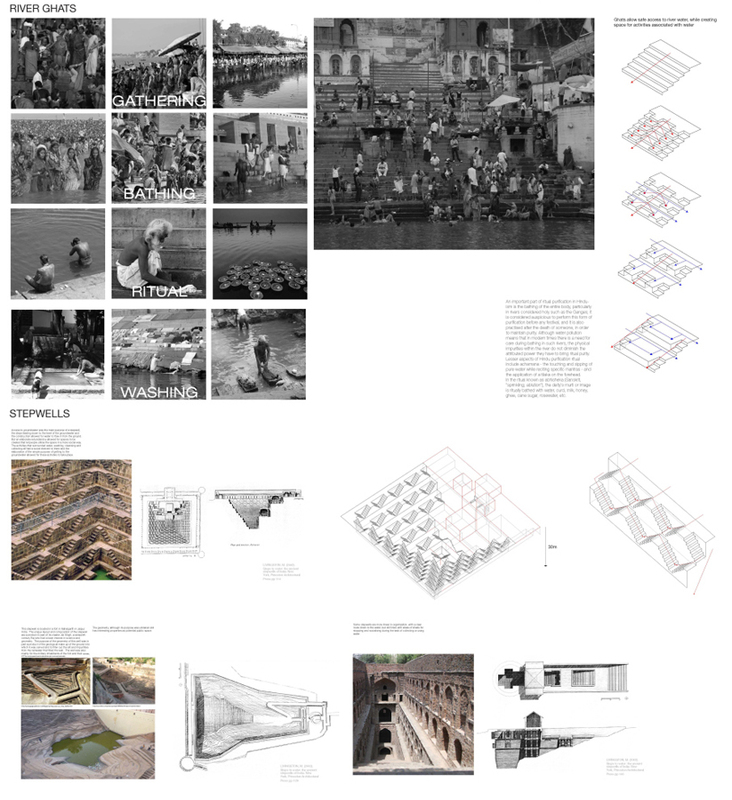 This traditional knowledge, expressed in cultural artefacts such as the stepwell, is the product of generations of trial and error.Using language as a parallel to architecture in its ability to organize and express cultural values, the project looks at ways of linguistically structuring the search space of a genetic algorithm to instrumentalise an exploration of cultural forms that communicate a connection with an augmented hydro-ecology. 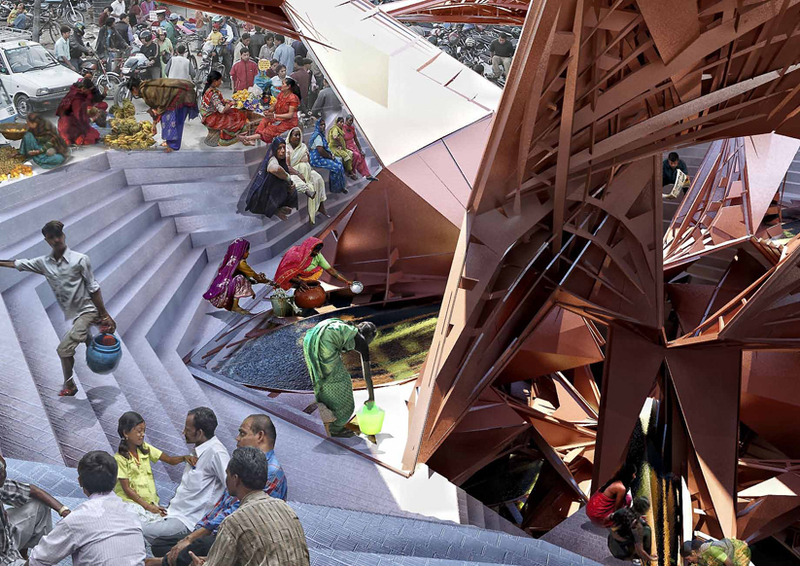 The water architecture of India and the Himalayas communicates a sacred and social connection between the culture and its hydrology, while also reflecting practical systems for how to conserve, manage and sustainably use water throughout the seasons of the year. 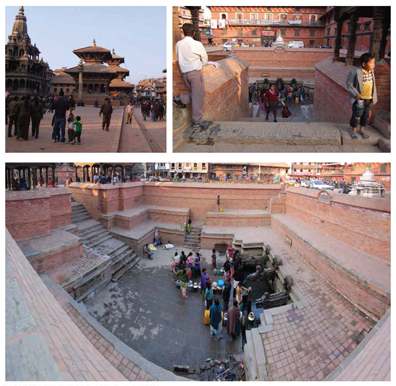 In Kathmandu its stepwells emerge in a very urban scenario, and are related directly to the surrounding urban context. 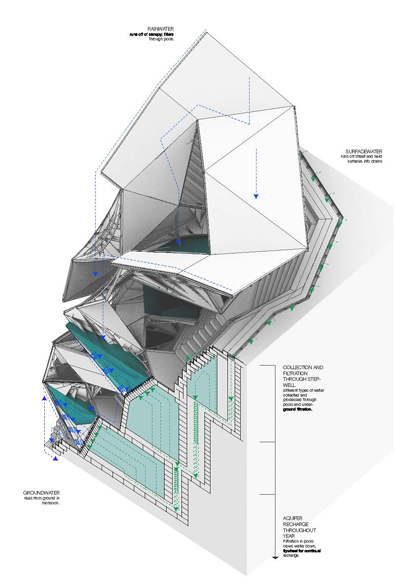 There are spaces for storage of water for dry seasons as well as spaces for the direct access to groundwater. 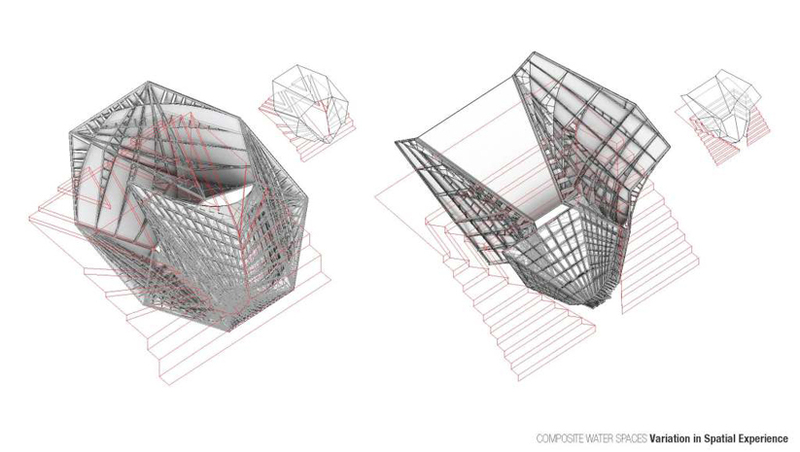 These spaces vary in spatial organization and appearance based on their predominant, traditional social uses. Some are related directly to domestic use, serving a surrounding community, some are set apart for religious ceremony, and some are more public spaces acting as a gathering point for commerce and trade. Some stepwells even function solely for the benefit of a particular caste, such as the Dungadhara for the washer people of Kathmandu. 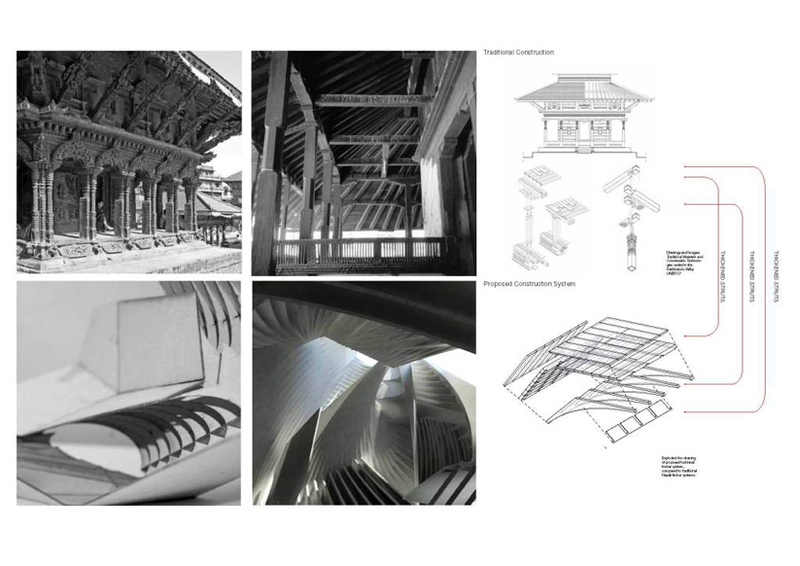 Another aspect of public spaces in Kathmandu is the architectural emphasis of large canopy eaves. Temples and areas of high cultural importance in Kathmandu (such as Bhaktapur) are of a traditional Newari timber and brick construction with large canopied eaves that create deep shadowed spaces beneath. 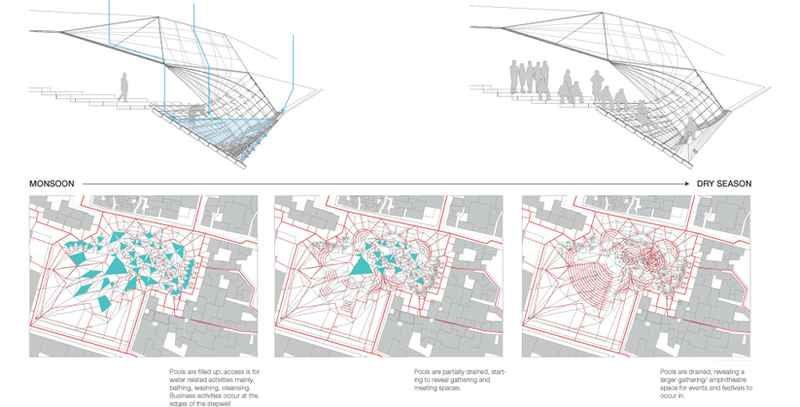 In attempting to categorize and qualify the elements of these cultural spaces in Kathmandu, special notice has been made of the canopies of these public spaces as describe a distinct spatial experience that relates to the traditional construction and manufacture ecology in the valley. 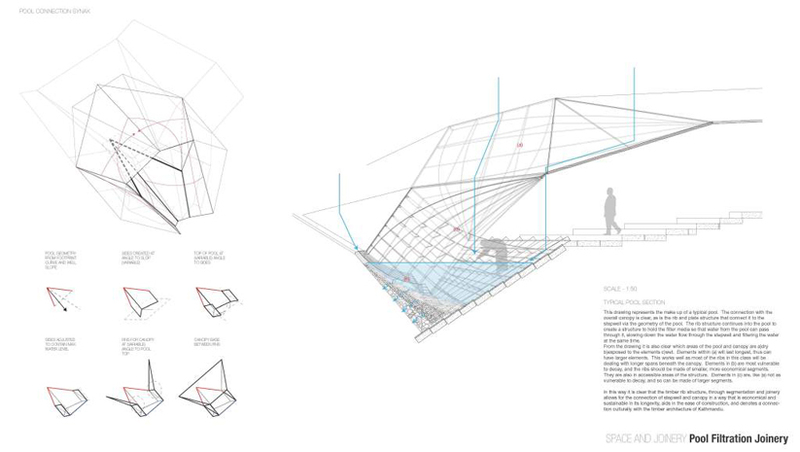 In order to sustain any public spaces in Kathmandu, it is important to take advantage of this manufacturing ecology. The temples and traditional buildings are maintained by the constant reworking and replacement of their timber elements. 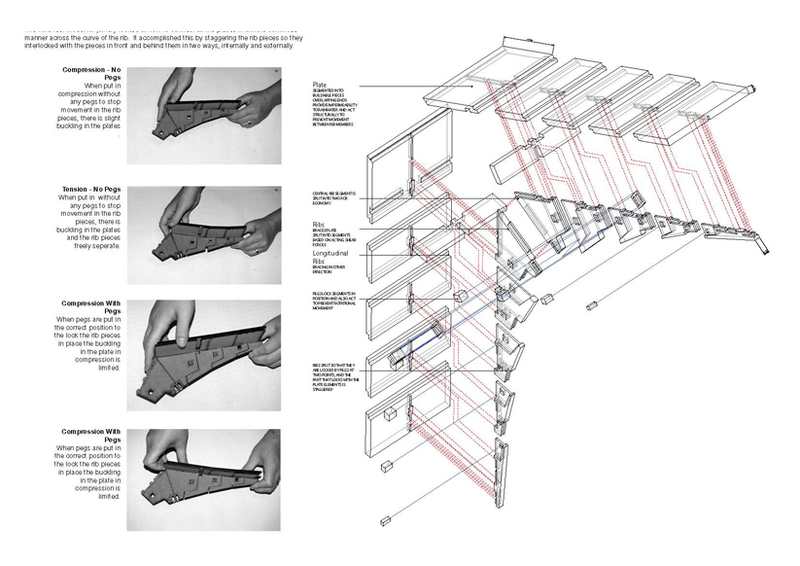 The traditional methods of timber construction in the valley take advantage of this in their tokenisation of parts that can be taken apart and replaced without affecting the whole structure. 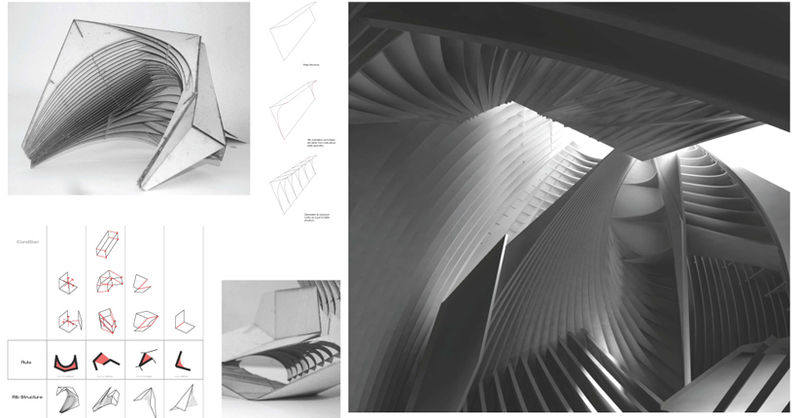 A similar strategy is pursued in this project, where all the structural elements of the canopy are segmented and connected in the tradition friction jointed construction in order that they can be replaced throughout the course of the structure’s life. Linguistics finds certain patterns for how languages develop and change over time. One of these patterns is expressed in Piotrowski’s Law, that states that the change in the form of a word results from the interaction between new and old forms of that word, as a typical growth process. 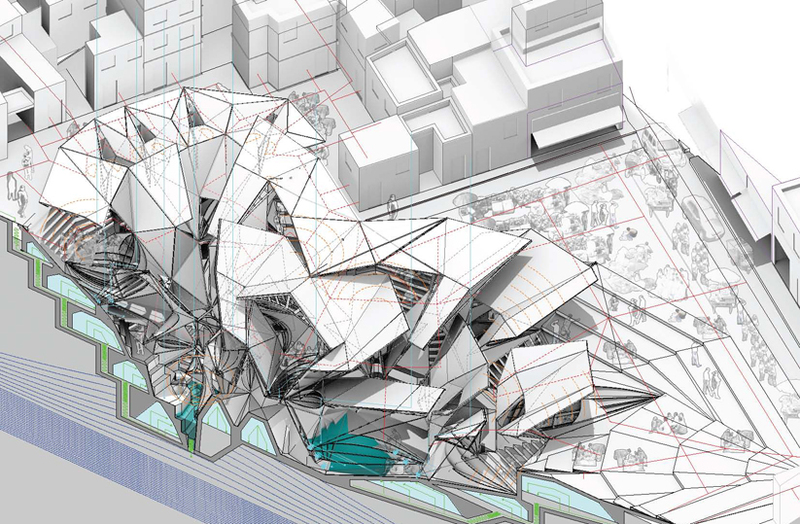 This idea is the basis of the design methodology in this project as a way of generating culturally specific types via a process of growth between old and new forms. 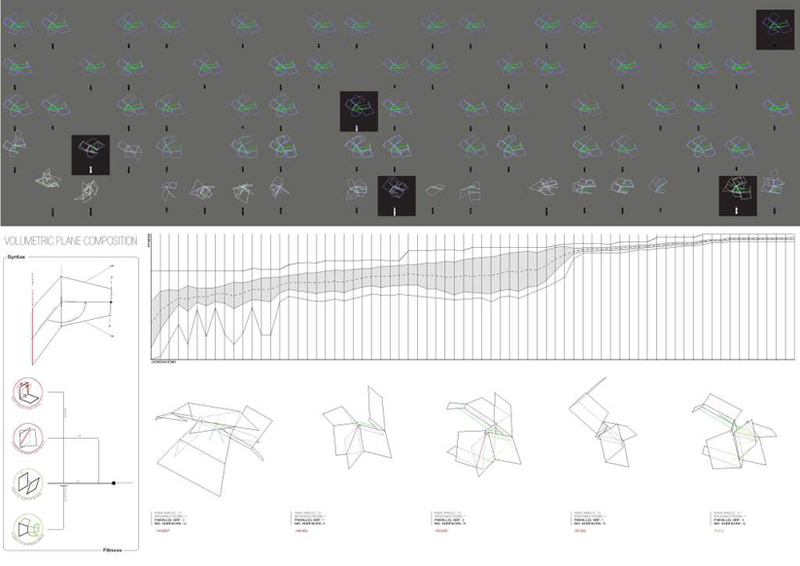 Using language as a parallel to architecture in its ability to organise and express cultural values, the project will look at ways of linguistically structuring the search space of a generative algorithm, to instrumentalise an exploration of cultural forms that communicate a connection with an augmented hydro-ecology. 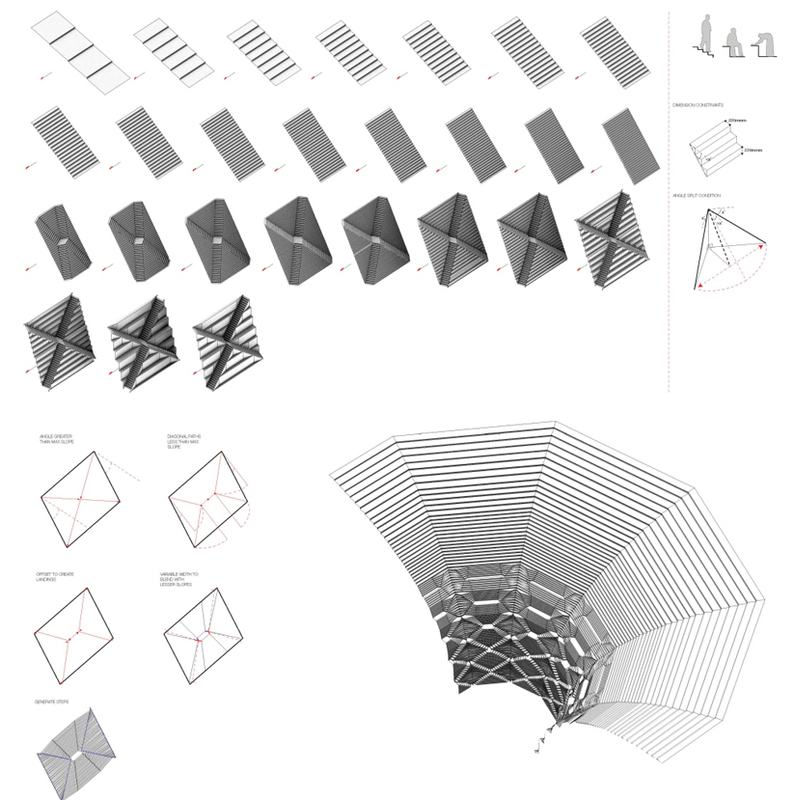 This process of evolutionary composition in the geometry of the augmented stepwell typology generates new forms and spaces that mediate between cultural grammars and ecological parameters. 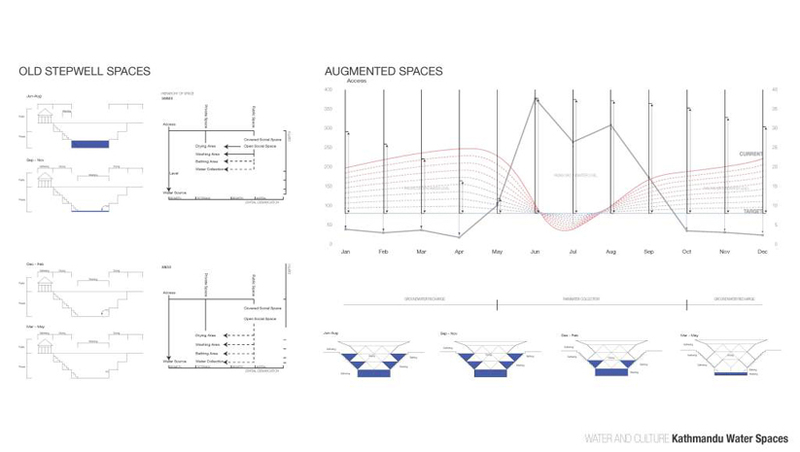 These partial solution steps lead to an integration of an augmented ecology in a cultural artefact that communicates a societal connection with water management. 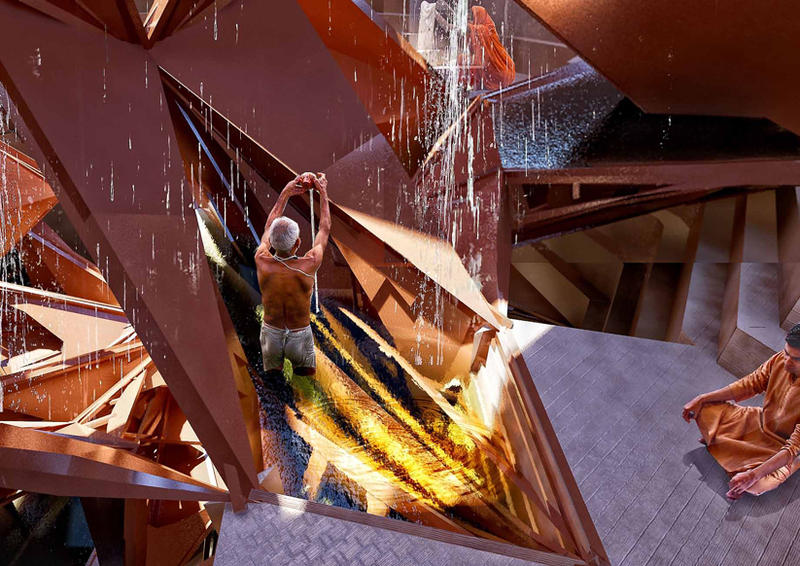 The building becomes a drawing, a representation of the relationship between cultural values and the ecological factors in a way that instrumentalises the existing connection of the society to its environment, to address present water issues by augmenting supply and mitigating overuse.